The Bistro is here! 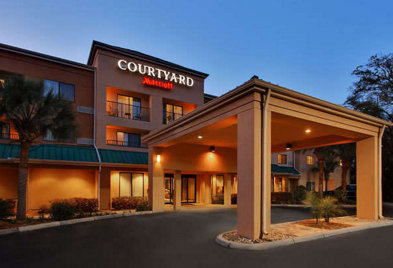 The Courtyard by Marriott Gainesville FL hotel near Archer Road & I-75 is home to the University of Florida and Gator football. Nearby you'll find more than just the University; check out the Florida Museum of Natural History, Harn Museum, the Santa Fe Community Zoo, the Oaks Mall, and the Kanapaha Botanical Gardens which are just a quick drive from the hotel. Guests traveling to our University of Florida hotel will enjoy the free high speed Internet access, WiFi, a 24-hour business center, large in-room workstation and access to meeting space at our Gainesville, FL hotel. Enjoy a hearty breakfast at the Bistro and grab a quick snack from The Market when on the run. We are dedicated to making sure you can maintain your health on the road, so take advantage of our 24-hour fitness center and unwind at the end of the day by enjoying the outdoor pool and spa. We hope to see you soon at the Courtyard Gainesville, FL!